Traveling to a different time zone can be exciting – and it can take some getting used to. Depending on how far you travel, the difference in how your body responds literally could be night and day. That's why frequent travelers often have to deal with jet lag. The most common symptoms of jet lag are sleepiness during the day and wakefulness, often with insomnia, at night, headache, and stomach upset. None of these are particularly pleasant even when you're home. Imagine dealing with feeling tired and ill while on vacation? Fortunately, there are ways to prepare for time zone transitions. If you have a trip coming up or you travel often but still haven't mastered the fine art of adjusting to a different time zone, consider the following advice before you book your next flight. Light, whether from the sun or a lamp, has a strong effect on the body's circadian rhythms, which is one of the factors that determine when we're alert and awake and when we're tired and need to sleep. When you travel to another time zone, there's a dramatic shift in your exposure to light and misalignment of your body’s sense of day and night. The sudden disruption of your circadian rhythms that occurs with jet lag can be distressing, especially the further you travel. If you fly from, say, the east coast of the United States to the west coast, you'll be crossing only a few time zones and adjusting will be relatively easy. But if you cross oceans and continents it will be more challenging. In general, it can take one day per time zone changed for circadian rhythms and sleep to get in sync. How quickly you switch time zones matters as well. Since driving or traveling by bus or even train takes longer than flying, your body has an opportunity to adjust to time zone changes gradually. For example, if it takes 10 hours to pass through a time zone while driving, then you essentially have a half day to accommodate for the shift. Finally, the direction of travel impacts circadian rhythms. You may have heard a frequent traveler say, "East is a beast, west is best." What he means is that traveling in a westward direction is often easier to tolerate because it is easier to shift the circadian rhythm to a later time. To think about it another way, consider how easy it is to stay up a few hours later in the night and how challenging it can be to wake up that much earlier in the morning. If you're planning travel that will land you in a different time zone, severe jet lag isn't inevitable. These tips will help you prepare your body for the change so that you can enjoy your trip with as little disruption to your sleep as possible. Plan ahead. Before your trip, figure out by how much you'll need to shift your sleep and wake times to be in sync after you arrive. Allowing enough time to do it gradually, begin to go to bed earlier and get up earlier, or vice-versa depending on the direction you'll be traveling in, to get your body used to the new time zone before you have to live in it. Make yourself stay awake. This will generate a very robust sleep drive and may counteract some of the issues related to a misaligned circadian rhythm. Much like pulling an all-nighter, your desire for sleep will be exceptionally strong if you stay awake for a prolonged period, no matter what time zone you're in. One way to do this: Don't sleep on the plane and when you arrive, fight the urge to take a nap, and try to stay awake until your normal bedtime based on local time. See the light. The most important factor in resetting your body clock is light. If you can, get 15 to 30 minutes of direct sunlight as soon as you wake up. Go for a walk, eat breakfast outside, or just sit in the sun and read. You will find that keeping a regular bedtime and wake time with morning light exposure will help a great deal. Deflect drowsiness. When dealing with jet-lag related daytime sleepiness, the same go-to remedies you use at home can help: a cup of coffee or tea, say, or a strategically timed nap (try not to sleep for longer than 20 minutes, though, or you may wind up groggier than when you put your head on the pillow). Don't drive when you're drowsy, especially if you'll be in a rented (and unfamiliar) car and maneuvering through unfamiliar territory. Take public transportation or call a cab until you're alert enough to safely man the wheel. Consider medication. A low dose of melatonin several hours before your desired bedtime may help align your circadian rhythm to the new time zone, and higher doses may help you sleep if taken at bedtime. Your doctor may suggest sleeping pills if you know you really have a hard time adjusting to new time zones in more natural and organic ways. Rewind in preparation for going home. 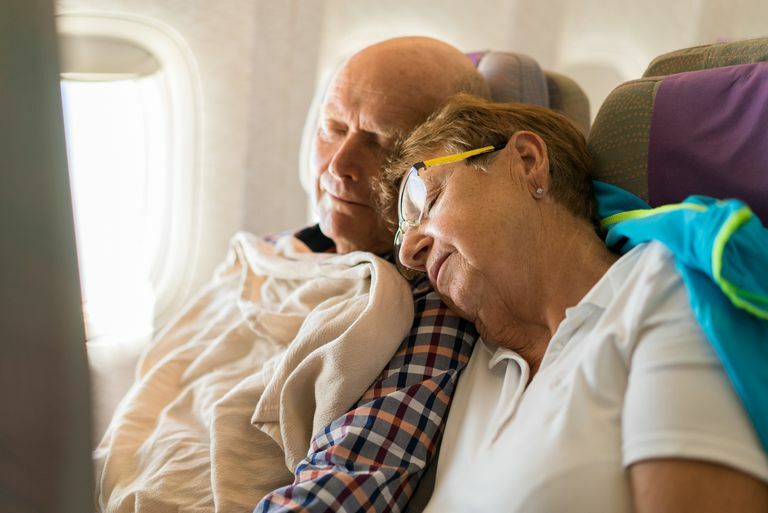 As your trip comes to an end, ease yourself into the change to come by gradually adjusting your bedtime and wake time in 30- to 60-minute increments towards the new clock setting. If this isn't possible, follow the same advice above to adjust to the new time zone at home. Kryger, MH et al. Principles and Practice of Sleep Medicine. Elsevier, 5th edition, 2011.